David Latimer first planted his bottle garden in 1960 and last watered it in 1972 before tightly sealing it shut 'as an experiment'. The hardy spiderworts plant inside has grown to fill the 10-gallon container by surviving entirely on recycled air, nutrients and water. Gardeners' Question Time expert says it is 'a great example just how pioneering plants can be'. Some of that light energy is stored in the form of adenosine triphosphate (ATP), a molecule that stores energy. The rest is used to remove electrons from the water being absorbed from the soil through the plant's roots. These electrons then become 'free' - and are used in chemical reactions that convert carbon dioxide into carbohydrates, releasing oxygen. But the eco-system also uses cellular respiration to break down decaying material shed by the plant. In this part of the process, bacteria inside the soil of the bottle garden absorbs the plant's waste oxygen and releasing carbon dioxide which the growing plant can reuse. While there’s no denying that consumers are increasingly using social media in just about every area of their lives, they still aren’t into shopping there. A new global study from PwC, the global consultancy, reports that last year, only 12% of consumers bought anything through social media. Nor does social media buzz do much to drive sales: Only 18% of those consumers active in social media made a purchase as a result of information they got via their social-media connections. But the survey, based on 11,000 people in 11 countries, did highlight a fast-growing willingness to interact with brands via social media, with 59% saying they follow brands through social channels, up from 49% last year. And 27% say they’ve discovered brands they didn’t know about this way, compared with 17% last year. One big exception is China, where one in four shoppers has already made a purchase via social media. Brand lovers - This segment offers the most potential for future shopping, and includes the 38% of consumers now following brands and retailers, up from 33% last year. And they are the fiercest shoppers, with 53% going into an actual store at least weekly (compared with 45% of the overall sample), and 45% making at least one online purchase per week. Deal hunters - Nearly half of the survey fell into this category, and will click through to online stores if they think they’ve spotted an appealing offer. Its slow start as a commerce channel notwithstanding, social media continues to be a critical component of brand building. The report says. COMMENTARY: Although some brands over the years have been skeptical about how social media can bring in revenue, a new infographic reveals social commerce sales are expected to bring in $30 billion each year by 2015, with half of web sales to occur through social media. Cloud marketing software provider Vocus has put together an infographic with stats from Gartner Research highlighting how brands are currently using social media and what trends are on the horizon. According to the data, Facebook drives 26% of referral traffic to business websites and those numbers are only expected to increase. About 20% of shoppers already prefer buying products through a brand's Facebook page compared to its website. Although Facebook users still use the platform largely for personal use, one in three businesses embrace it to reach out to consumers. Nearly 10 million registered small businesses have a Facebook presence, and 89% of agencies use the social network to advertise for their business clients. Fans who follow brands on Facebook are also more likely to purchase items from the company than non-fans. With that in mind, about 89% of small businesses believe Facebook is a valuable marketing tool for their brand. In an article dated January 28, 2013 appearing in Social Commerce Today, it was announced that Payvment, the leading provider of Facebook enabled social commerce storefronts, announced that it will cease operations on February 28, 2013 and transfer all accounts to social commerce platform Ecwid. These two companies commanded the lion's share of social commerce stores on Facebook. Facebook does not report revenues from ecommerce storefronts and neither do Ecwid and Payvment, but it is important to note that these customers are mostly small businesses conducting ecommerce sales on Facebook. On the flip side of the coin, large retailers have not fared very well selling their goods on Facebook. In fact, in a blog post dated February 17, 2012, I reported that Penneys, Nordstroms and Gap had opened Facebook stores, but quickly closed them down only after a few months. The failure of large retailers to generate much traction on Facebook makes you wonder if it is even possible to generate significant ecommerce sales through Facebook. The above infographic forecasts taht social commerce sales could hit $30 billion by 2015. There are still a lot of unanswered questions, and the above PcW survey certainly casts doubts about social commerce or F-commerce (Facebook). What is one tip that you have for effectively delegating the job of social media marketing at your company? Answered offered by social media guru's. No. 1: Never Delegate Social Media Externally - From Laura Roeder of LKR - Remember that social media is not just marketing but customer service -- people are interacting with, and asking questions about, your company and the person answering them must be knowledgeable. And it's especially important because a bad social media interaction can be spread virally in seconds. Choose someone who is able to answer any question and can speak in the voice of your brand. No. 2: Use a Team Platform to Manage - From Logan Lenz of Endagon - Depending on the size of your company, there's often the need for more than one person to manage social media accounts and engage with customers. Whether it's through multiple profiles or inquiry delegation, social media management platforms like Hootsuite are extremely valuable when organizing the social media tasks throughout a large team. No. 3: You Have to Know What You're Asking - From Thursday Bram of Hyper Modern Consulting - Just deciding your business needs a Facebook page or a Google+ presence and then finding someone to handle the workload isn't enough. Before you can delegate, you have to have a good picture of what your competitors are doing and what results you can get -- as well as what the work really entails. Otherwise, social media can turn into a black hole. No. 4: Build a Social Media Strategy - From Andrew Saladino of Just Bath Vanities - Establish clear objectives and success metrics for your social media campaign. Identify the best channels and approach for your company and look for available opportunities that might be available on some of the less known social media Websites. Craft a unified concept and company message to be used throughout all communications. No. 5: Why Your Company's Biggest Evangelist Should Run Social Media - From Matt Wilson of Under30CEO.com - If you want to delegate social media, you need to find someone who is absolutely obsessed with your company. Bring on a person whose passion oozes out every time they speak about your product or service. This is the only way to stand out in a crowded marketplace. Make sure that person is extremely outgoing, helpful and most of all, sincere. No. 6: Set Time Standards - From Elizabeth Saunders of Real Life E® - You can always do more with social media, so it's important that you clearly explain how much time you would like someone to spend on different social media activities. Also, you should establish standards of average response times to new messages so that you provide a consistent customer experience. No. 7: Master the Corporate Voice - From Doreen Bloch of Poshly Inc. - Before delegating social media marketing, choose and be able to describe your company's voice. Is your firm fun and chatty online? News-centric and authoritative? Witty? Then, ensure your social media team members master the tone. If all your social media marketers speak consistently, your social media implementation will be more successful. No. 8: Delegate to Core Competency - From Lauren Maillian Bias of Luxury Market Branding - Recognize the social media strengths and interests of each person in your company. Delegate specific aspects of social media content to team members that are most competent in that space and let them crush it. If your team works on their core competencies they will always be excited and passionate about the content they create. And, most importantly, that content will be authentic. No. 9: Make Sure They Understand Your Company - From Lucas Sommer of Audimated - You should be 100% on the same page with whomever you are delegating social media to. Social media is the public relations of the Internet community and whoever is responsible for managing your social media should have a firm understanding of the goals you have for social media and how you are going to portray your business. No. 10: No Weak Links - From Arjun Arora of ReTargeter - Every member of your company has a public voice, so it's important to make sure that your entire team is involved with your brand socially. This means they should be sharing the great things that you do with their network. But everyone must be in line with your brand's mission. Make sure that your company defines its core value proposition, and make it a point for every employee to adhere to it. A commission official told HuffPost in an email. For its part, Earth Open Source said that government approval of the ubiquitous herbicide has been rash and problematic. Wrote the report’s authors. "Our examination of the evidence leads us to the conclusion that the current approval of glyphosate and Roundup is deeply flawed and unreliable. What is more, we have learned from experts familiar with pesticide assessments and approvals that the case of glyphosate is not unusual. They say that the approvals of numerous pesticides rest on data and risk assessments that are just as scientifically flawed, if not more so." "This is all the more reason why the Commission must urgently review glyphosate and other pesticides according to the most rigorous and up-to-date standards." Monsanto spokeswoman Janice Person said in a statement that the Earth Open Source report presents no new findings. Person said. Jeffrey Smith, executive director of the Institute for Responsible Technology, which advocates against genetically modified food said. The EPA told HuffPost in a written statement. Wrote Carrasco, director of the Laboratory of Molecular Embryology at the University of Buenos Aires. "The findings in the lab are compatible with malformations observed in humans exposed to glyphosate during pregnancy. I suspect the toxicity classification of glyphosate is too low. In some cases this can be a powerful poison." Guillermo Cal, executive director of CASAFE, Argentina's association of fertilizer companies, in a statement at the time said. "A ban, if approved, would mean we couldn't do agriculture in Argentina." "pathogen appears to significantly impact the health of plants, animals, and probably human beings." In his letter to the Agriculture Department, Huber also commented on the herbicide, saying that the bacteria that he’s concerned about appears to be connected to use of glyphosate, the key ingredient in Roundup. He wrote. "It is well-documented that glyphosate promotes soil pathogens and is already implicated with the increase of more than 40 plant diseases; it dismantles plant defenses by chelating vital nutrients; and it reduces the bioavailability of nutrients in feed, which in turn can cause animal disorders." A spokesman eventually conceded their scientists do study glyphosate. The USDA said in a statement. While Huber acknowledged his research is far from conclusive, he said regulatory agencies must seek answers now. Huber said. John Fagan of Earth Open Source said. The EPA told HuffPost in a statement. "EPA ensures that each registered pesticide continues to meet the highest standards of safety to protect human health and the environment. These standards have become stricter over the years as our ability to evaluate the potential effects of pesticides has increased. The Agency placed glyphosphate into registration review. Registration review makes sure that as the ability to assess risks and as new information becomes available, the Agency carefully considers the new information to ensure pesticides do not pose risks of concern to people or the environment." Jeffrey Smith, of the Institute for Responsible Technology said. Fagan told HuffPost that among developmental biologists who are not beholden to the chemical industry or the biotechnology industry, there is strong recognition that Carrasco’s research is credible. He added. In section I.A.2. Principal and Supporting Studies (Oral RfD), the EPA says that the Monsanto Company. 1981a. MRID No. 0081674, 00105995, was used as a "principal and supporting study". Monsanto's conclusion from tests on rats were, "No treatment-related effects on fertility were noted, nor were any systemic effects in adult rats apparent." You didn't expect Monsanto to claim Glphosate is toxic to rats do you? In section I.A.4. Additional Studies/Comments (Oral RfD), there are four test findings dated 1981b, 1985, 1980a and 1980b on Glyphosate. All of them were conducted by Monsanto. Regarding the above Monsanto's Oral Rfd tests, the EPA said. "The quality of the chosen study is good; therefore, it receives a high confidence rating. The quantity and quality of the available supporting studies warrant high confidence in the data base. High confidence in the RfD follows." Classification — D; not classifiable as to human carcinogenicity. Just how in the hell can the EPA claim that Glyphosate does not present a carcinogenic danger to humans when the tests are conducted strictly on mice and all of the test data was provided by Monsanto? According to Monsanto, an estimated 89 percent of domestic soybean crops were Roundup Ready in 2010, and as of 2010, there were 77.4 million acres of Roundup Ready soybeans planted, according to the Department of Agriculture. According to Earth Open Source, industry regulators in Europe have known for years that glyphosate, originally introduced by American agricultural biotechnology giant Monsanto in 1976, causes birth defects in the embryos of laboratory animals. In 1996 New York State's Attorney General sued Monsanto for describing Roundup as "environmentally friendly" and "safe as table salt." Monsanto, while not admitting any wrongdoing, agreed to stop using the terms for promotional purposes and paid New York state $250,000 to settle the suit. Farmers and others in Argentina use Roundup primarily on genetically modified Roundup Ready soy, which covers nearly 50 million acres, or half of the country's cultivated land area. In 2009 farmers sprayed that acreage with an estimated 200 million liters of glyphosate. Monsanto spokesperson Janice Person said in a statement that the Earth Open Source report presents no new findings. Person said. If what Ms Person says is true, then why doesn't Monsanto provide copies ofthe lab tests on Glyphosate by the "regulatory authorities and independent experts around the world". What is disappointing is that the EPA made no effort to suspend use of Glyphosate until further tests on the effects of Glyphosate on humans was completed. Again, the EPA is relying on Monsanto to do this additional research. What the EPA should've done is ordered Monsanto to have an independent third party test lab conduct the tests. So far, there appears to be some evidence that Glyphosate could, on the basis of tests on lab mice, present a possible carcinogen danger to humans, but more thorough tests are needed, preferably by a reliable and independent third party. Seeds and genomics represented $2.36 billion in sales for Monsanto, most of its business. The company continues its long-term transition from a seed and herbicide company to one in which the business is largely genetically altered seeds. There is resistance to such seeds, which are genetically modified organisms (GMOs). On February 11, 2011, the US Department of Agriculture (USDA) approved plantings of three genetically engineered (GE) crops in as many weeks, including Monsanto Co.’s Roundup Ready sugar beets and alfalfa that are engineered to tolerate Roundup Ready weed-killing herbicide. The USDA on February 11 also legalized, without restriction, the world’s first GE corn crop meant for biofuel production. Biotech giant Syngenta’s Event 3272 seed corn will simplify ethanol production and is not meant to feed animals or humans. The approvals flew in the face of legal and regulatory challenges posed by GE crop opponents and members of the agricultural industry. Opponents fear the GE crop varieties could contaminate conventional food crops and promote the overuse of herbicides like the glyphosate-based Roundup and more toxic chemicals used to kill glyphosate-resistant weeds. Monsanto won a victory on February 4 when the USDA partially deregulated Roundup Ready sugar beets. A federal court in August 2010 temporarily banned the beets and ordered the USDA to re-review the environmental impacts of the Roundup Ready sugar beets as the result of a lawsuit filed by farmers and environmental groups. Monsanto has been quietly and relentlessly expanding its control over and profit from our food supply. Along the way, contaminating the food supply and threatening public health worldwide with its genetically engineered “foods”and herbicides which have demonstratively deleterious effects on human health. Monsanto gets to sell its products even though there is data that indicates they would have adverse impacts if mixed with naturally occurring food crops. With The Secretary Of Agriculture Vilsack’s long pro-biotech record, USDA rife with former Monsanto employees, FDA headed by Monsanto’s Chief Lobbyist Michael Taylor, the Frankenfood giant has completely captured and manipulated the very government agencies charged with ensuring the security of the food supply. They do Monsanto’s bidding. At the expense of your health and safety. With the help from its friends in the Department of Agriculture, Monsanto's financial performance has rebounded from FY 2010 when its Glyphosate patent expired and other competitors entered the market and robbed about 40% of the profits from the sale of Roundup products. Ahh, it's so nice and very profitable for Monsanto to have so many Monsanto-friendly and influential friends in high places. Oh, I nearly forgot to mention. Monsanto's stock has also increased in value from $46.05 in July 7, 2010 to $65.96 on June 24, 2011. Life is good at Monsanto headquarters. HOW SYNTHETIC BIOLOGY COULD MAKE IT POSSIBLE TO GAUGE YOUR HEALTH OR PRESENCE OF DISEASE WITH COLOR-CODED POO? Daisy Ginsberg worked with scientists engineering e.coli strains that secrete color-coded signals -- and that's just the beginning, as designers turn their talents to Mother Nature. Synthetic biology is all about re-engineering living organisms to make them do stuff we would find useful -- like eating oil spills or excreting superfuels. It's a tall order, but we're well on our way already. Still, a slightly easier tactic would be to just tweak the design of organisms that already exist, rather than building synthetic genomes from scratch. "Bacteria could be programmed to do useful things, such as indicate whether drinking water is safe by turning red if they sense a toxin." "The colour generator bricks are being used in labs around the world, integrated into other systems and circuits." E. chromi won the Grand Prize at the 2009 International Genetically Engineered Machine Competition and was nominated for a 2011 Brit Insurance Design of the Year Award, but Ginsberg hasn't been sitting on her laurels. She currently working as a Design Fellow at Synthetic Aesthetics, a multidisciplinary research project by the University of Edinburgh and Stanford University that joins designers with scientists to explore answers to the question: How would you redesign nature? "Traditional synthetic biology (if such a new discipline could even be said to have traditions), is focused on control -- about realising the work of design into a functional reality. Synthetic biologists talk about 'design', but the exact use and meaning of this word in the context is quite fuzzy here. Do we want a version of nature that is purely about function and control, or should other forms of creative, social and cultural thinking be at play when we are redefinining the world around us?" In that regard, even relatively simple projects like E.Chromi have an almost user-focused aspect to them in addition to the formidable engineering challenges that must be solved in order for them to function at all. 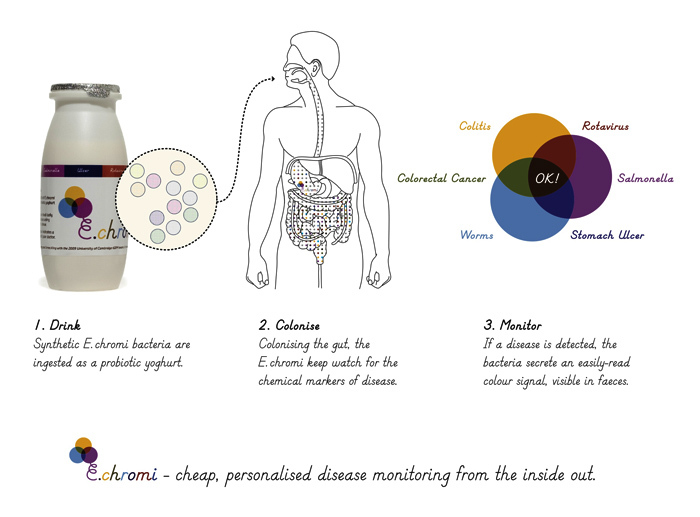 Instead of just demonstrating a proof of concept that an e.coli could be induced to emit pre-programmed colors, the E.Chromi team carefully selected actual, specificcolors for the bacteria's "output" that are optimized for visual interpretation by humans. In Ginsberg's view, this is the kind of design thinking that must be applied to synthetic biology as a whole, if it's ever going to make a big dent in solving our problems. Geniuses like Craig Venter may invent the synthetic-biology version of a computer, but it'll take product designers like Jony Ive to get us to the iMac level. And innovators like Daisy Ginsberg are leading the way. COMMENTARY: Synthetic biology is now being used by Amyris to produce synthetic biofuels from algae that has been engineered synthetically to produce ethanol or a fossil fuel-like by-product that can be refined into gasoline and jet fuels. It's not too farfetched that synthetic biology could be used to detect pathogens and toxins in your body. Color-coded poop fits is a great example, but how about color-coded blood, or color-coded sweat. Using "helper organisms" that would change color to represent a certain pathogen or toxin, could definitely help in detecting bacterial and viral infections. We are already using a form synthetic biology in AIDS, pregnancy, drug and alcoholic detection tests. It would be funny to hear, "Your poop or urine is blue, you've got the flu." This would could help doctor's to quickly diagnose pathogenic infections. And, depending on the deepness of the color, could decide whether to ask the patient to come in for treatment or go to the hospital. The science of synthetic biology combines biology and biology. Synthetic biology is more than color-coded poop. Wikipedia does a great job of explaining what synthetic biology is.